What's been going on with Washington, D.C./New York based philanthropic powerhouse couple Morris and Jaci Reid? They're busy preparing to host the upcoming Vh1 Save the Music Foundation's benefit concert and post VIP dinner at their East Hampton home on July 18th. Ne-Yo and Solange Knowles have both confirmed their performances and all of NYC society is clamoring for the much coveted post-dinner invites. The dinner will be sponsored by Tanqueray 10 and will include a list of who’s who from the Hamptons and beyond. Later in the summer, the Reids will host yet another star-studded event at their East Hampton, NY home when they hold the first ever benefit for Governor Paterson, the first African American governor of New York. In addition to philanthropic activities, Jaci is a contributor for various magazines, including Capital File, Uptown and most recently, Hampton magazine. Her articles include a feature on her dear friend, actress and philanthropist Victoria Rowell in Uptown magazine, and the Love Heals at Luna Farm fundraiser with Russell Simmons. View the article here. 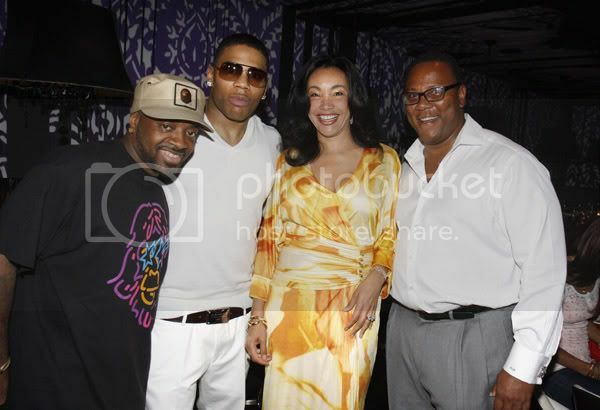 In photo above: Jermaine Dupri, Nelly, Jaci and Morris at a private dinner party they hosted for hip hop artist Nelly to honor him for his upcoming album and charitable work. In attendance were Tracey Edmonds, Tisha Campbell, Jill Marie Jones, Jennifer Freedman, Private Practice star Tim Daly and others.